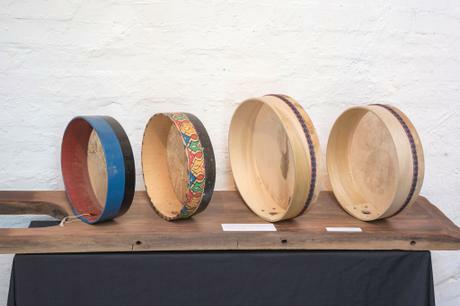 Frame drums have been played for millennia, with depictions of women playing them in 5800BC Mesopotamia and even earlier in Catal Hoyok, Anotolia. There are many different types of frame drums all over the world and played in various ways. If you look at music of the Arabic world, the Magreb, Turkey, Central Asia, the Mediterranean, Sufism and Shamanism, you will find the frame drum. It is a powerful and highly meditative musical instrument. In this course we will be crafting a traditional Moroccan Bendir Drum. The Bendir has a deeper shell than most frame drums and a snare placed under the skin which gives the quintessential ‘buzzing’ quality found in Moroccan drumming. Over the weekend you will gain knowledge of timber choices & the timber milling process. You will also prepare and then steam bend your shell. You will learn how to use hand tools for joining and preparing proficiently. We will also cover shellacking your shells, fitting snares, preparation & fitting of goat skins to the shell, trimming/banding and finally…some handy hints on playing rhythms! DEPOSITS - A $200 non refundable deposit will be required when registering for this Intensive Class. His recording credits as percussionist are both impressive and extensive. Internationally notable artists he has performed/ recorded with are: The Ross Daly quartet (Crete), The Tea Party (Canada), Coleman Barks (USA). In Australia his credits include the ARIA nominated album ‘Empires‘ by Latidtude 37, Bashka, Mista Savona, Alwan, Yair Dalal ,My friend the chocolate cake, Zulya and the children of the underground, Kozmik County and surf rock group, The Reefers. Matt first discovered MGFW in 2014 whilst attending the Shaker Bentwood Box course and became a student of Alastairʼs ever since. Other than the occasional fine furniture build, Matt focuses on crafting high end frame drums for musicians around the world and is currently designing a large set of 25 tunable drums to be performed by his frame drum ensemble here in Melbourne. When heʼs not playing or making drums…heʼs making Shaker Bentwood Boxes!